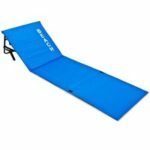 One way you can comfortably relax on the beach but still be close enough to the ground so you can feel the sand against your feet is to buy one of the best portable beach lounger mats. Throwing down your beach towel and lying on top of it is not for everyone, it’s not the most comfortable either. On the other hand, a reclining sun lounger can sometimes make you feel too disconnected from nature. 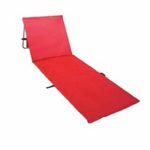 A somewhere in between option would be a beach lounger mat, which lets you relax nearly the same way a sun lounger does, but at the same time, you get to enjoy being close to the sand. 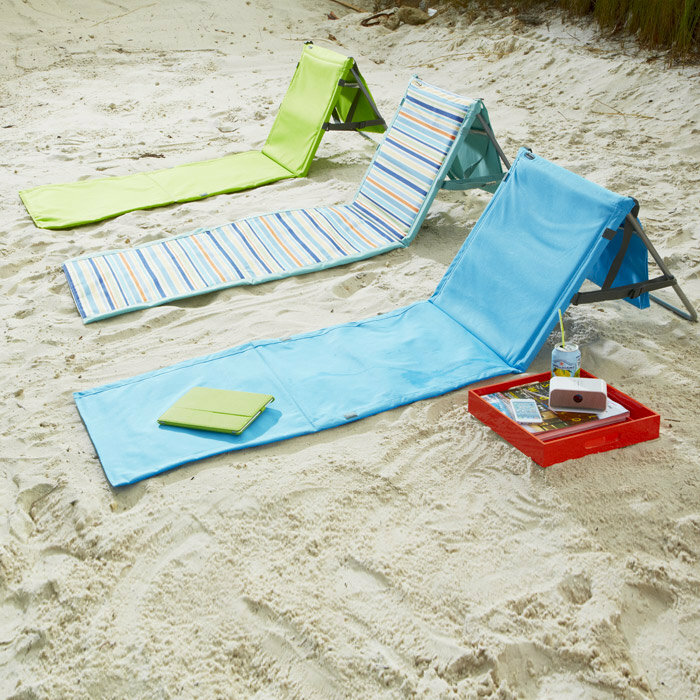 In addition, a beach lounger is extremely light and easy to carry around. It can also be used in the garden, park or camping. 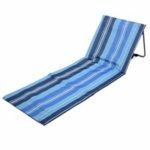 Alternatively, if neither of the above two suit your taste then, a folding wooden deck chair is perfect for relaxing and also allows you to keep your feet on the sand! 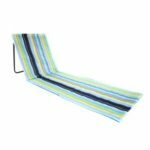 Perhaps for most people, choosing the best beach lounger may just boil down to the style they like the most. However, there maybe a few smaller details that can make a difference to your liking for the product. We’ll go through a list of features below and mention how you may find a certain feature more beneficial. 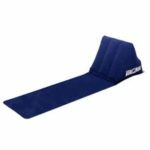 Adjustable backrest – Allows you to adjust the backrest according to how high you want the incline to be. However, with an inflatable beach lounger the inclination can’t be adjusted, it stays in one fixed upright position. Material – Most of the portable beach loungers will be made from either polyester or PVC. This material means that it won’t soak in water and can be cleaned easily. For this reason alone, this beats using just a beach towel on the sand! Dimensions – It’s not a design defect that the length of the beach lounger mat won’t be long enough for most people. The idea is so your feet hangs over the edge and rest in the nice warm sand. All of the models do fold up nice and compact so it can easily be carried around. Shoulder carry strap – Rather than having to carry it in your hand, the shoulder strap allows you to conveniently carry it over your shoulder. Additional features – At the back of some of the beach loungers there is a zipped storage compartment which is perfect for storing items such as a book, snacks, money, etc. Although it’s probably not the best idea to put anything valuable inside as it’ll be out of your sight. Unfortunately, thieves do operate around beach areas so could take advantage if you dosed off! Very lightweight, portable and easy to carry around. Sand doesn’t stick to the bottom and it’s very easy to clean. Doesn’t soak in water, so if you’ve been for a dip in the sea the water from your swimwear can be simply wiped off. More comfortable than lying on a beach towel. Allows you to be on the sand still so you don’t feel disconnected from nature.